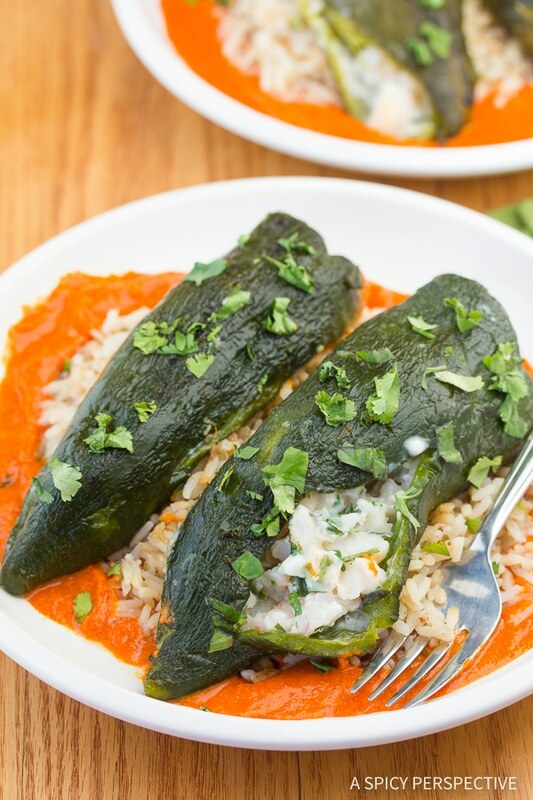 Breaking tradition with Stuffed Poblano Peppers with Red Pepper Puree and Coconut Rice. When you think of Chile Relleno, what comes to mind? Fried. Heavy. Spicy. As someone who avoids frying like the plague, I’d like to dump the first two stereotypes and add the terms Creamy, Succulent and Elegant to the mix. Most Chile Relleno recipes prepared here in the states, are deep fried masses of oozing cheese. As tempting as that may sound, they often leave you feeling like you got a swift kick in the stomach. Believe it or not, not all stuffed peppers prepared in Latin America are deep fried. And even if they were, that doesn’t mean we have to do it that way, right? After all, chile relleno simply means “stuffed chile” in Spanish. How it’s stuffed and cooked is up for debate. 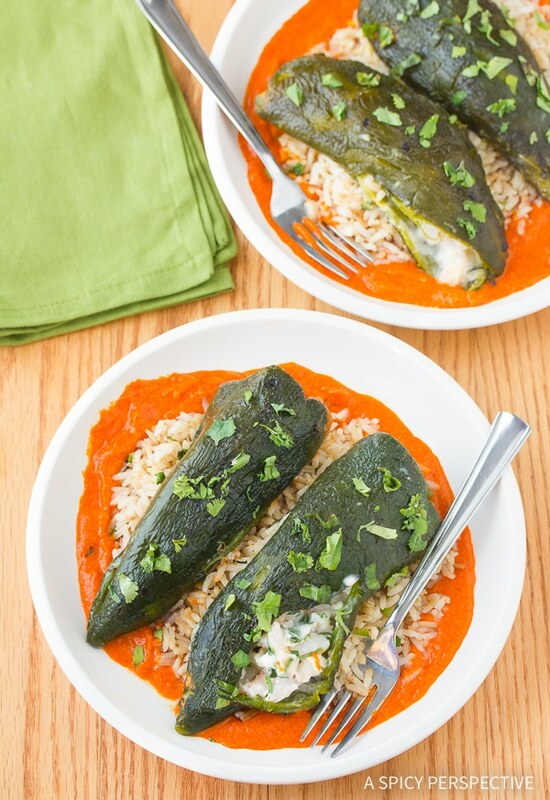 These Stuffed Poblano Peppers with Red Pepper Puree, served with Coconut Rice, are an elegant alternative to “traditional” chile rellenos. Creamy goat cheese and shrimp snuggle in fire roasted poblano peppers, atop tender coconut rice. As if that weren’t enough, a pool of silky red pepper puree gently caresses both the sweetness of the rice and the spicy poblano pepper. Delicioso! If you’ve missed enjoying chile relleno because of deep frying, give this Stuffed Poblano Peppers with Red Pepper Puree a try. You can serve it as 4 large servings, or divide it into 8 light portions! 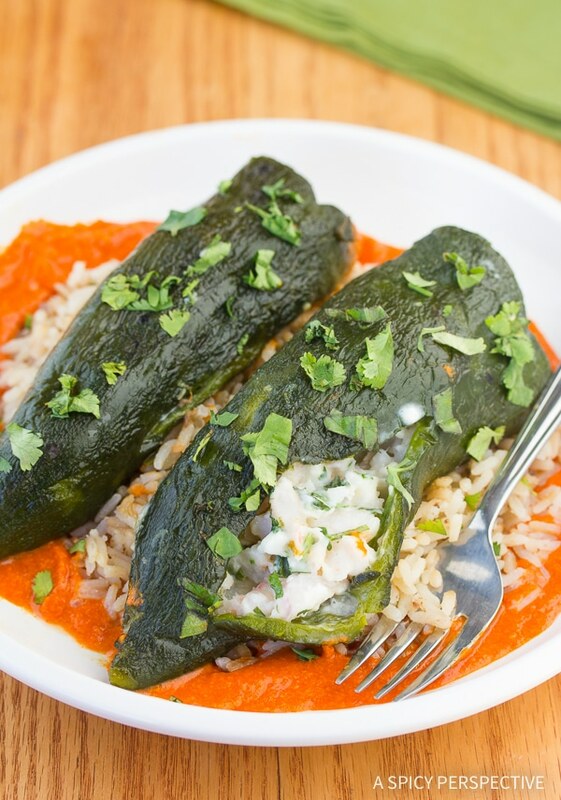 Breaking tradition with Stuffed Poblano Peppers with Red Pepper Puree and Coconut Rice. 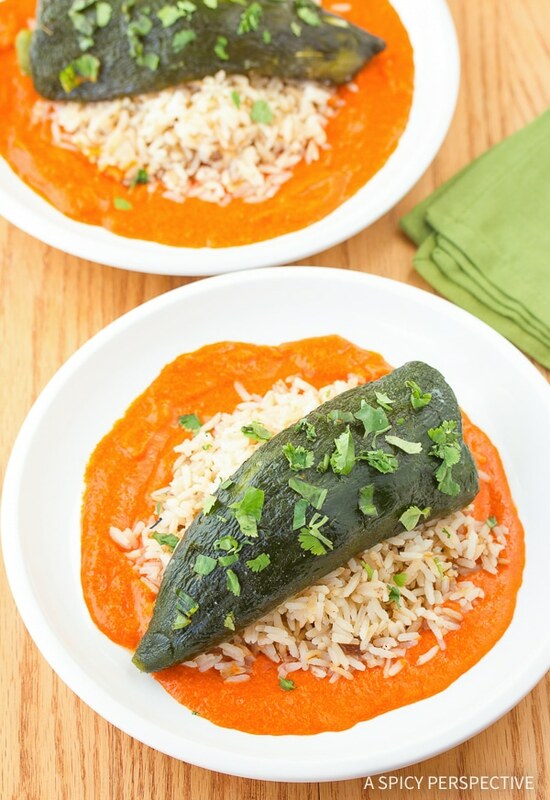 This lighter chile relleno is packed with goodness! Place all peppers in a large zip lock bag (or paper bag) seal, and let steam for 15 minutes. Heat 2 tablespoons olive oil in a medium pot over medium-high heat. Add 4 diced shallots and sauté for about 3 minutes. Add the garlic and sauté another 2 minutes until onion becomes translucent and tender. REMOVE HALF the onions and garlic and place in the blender. Add rice to the remaining onions in the pot and sauté another 2 minutes to toast rice. Add coconut milk, jalapeno, 1 1/2 teaspoon salt, and one 14-ounce can full of water. Bring the rice to a simmer, cover and cook until rice is tender and liquid has evaporated, about 15-17 minutes. Remove from heat and keep covered another 5 minutes. Once the rice is started, GENTLY peel all the peppers. Carefully remove the tops of the poblanos. Mix the shrimp, cheeses, 1 chopped shallot, cilantro, basil, and a pinch of salt in a medium bowl. GENTLY stuff each pepper with shrimp mixture and fold the top to close. Lay the peppers on a greased cookie sheet and bake 15 minutes. While the peppers are baking, add 1/4 cup cream, a pinch of cayenne pepper and 2 whole roasted peppers (seeds removed) in the blender. Puree until smooth. Taste and salt as needed—about 1 teaspoon. *You may need a little extra cream to create desired thickness! To plate: Pour about 1/4 cup of sauce onto a dinner plate. Place a round mound of rice to top of the rice with 2 stuffed peppers. Gorgeous dish and it has my stomach growling! Stufgfed poblanos are one of my favorites. They’re the best pepper to stuf fin my opinion: sort of smoky, spicy and sweet, all rolled into one marvelous package. I have made them before without frying them Mine tend to fall apart. You look like you’ve mastered keeping them in shape. OK! I live in San Diego, and I can HONESTLY say, I’ve never seen a stuffed pepper as good as yours. And your photos are absolutely stunning. The colors, the favors, the texture, OH MY!!! Shrimp-stuffed poblano peppers? Red pepper puree? Coconut rice? This sounds fantastic. I love that it’s a twist on a Mexican (?) classic, with just a tease of Thai thrown in there. I’ll definitely have to give this one a try. This is a wonderful dish, Sommer! 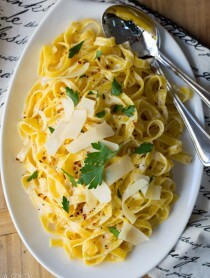 Love the red pepper puree..what lovely color and combo you ave used in the recipe. Awesome. i love how you plated this dish. simply beautiful and so elegant. love the flavors in here… yum! Great recipe! I love cheesy chiles too, but can’t handle them that often. Great way to lighten them up and make them a real main course. I absolutely must make this. I love everything about it especially that you didn’t fry it. I’m pinning it to try this week. It looks fantastic! Gorgeous plate of food! I love the look of the green Poblano peppers on that pool of red pepper puree, and the stuffing!!!! Yum…looks great. I made stuffed poblanos last year and my HANDS WERE ON FIRE! I was carefuly to not touch my eyes, but still my hands were stinging like mad. What do you recommend to prevent that? 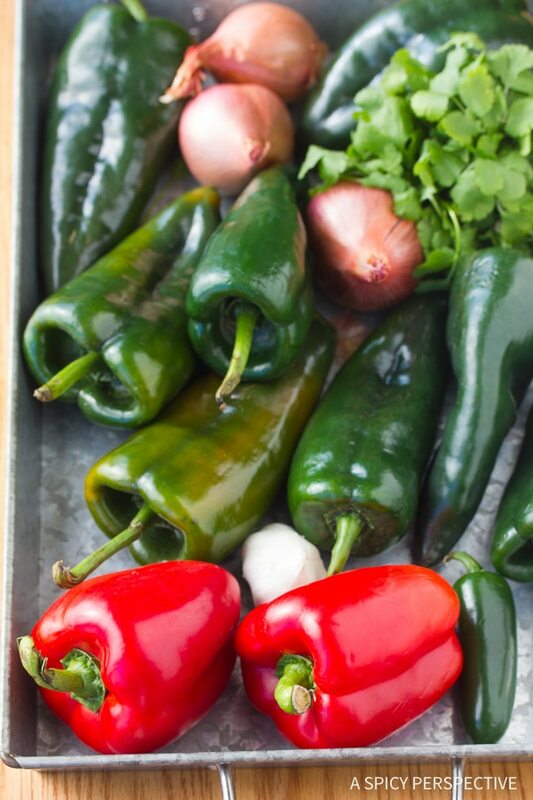 Poblanos are tricky because sometimes they are very mild and other times they are HOT! After you’ve cut the tops off, always smell them so you know what you’re dealing with. If they are spicy, you can put on rubber gloves before peeling them, or try rubbing your hands with veg. oil before touching the peppers. The oil offers a protective layer and allows the pepper juices to wash off easily. Seriously a unique recipe. I’ve also been looking for a good coconut rice recipe, I’ll have to try yours. I just had lunch and your stuffed peppers make my hungry. Love love love the shrimp filling! Beautiful photos as usual, Sommer! 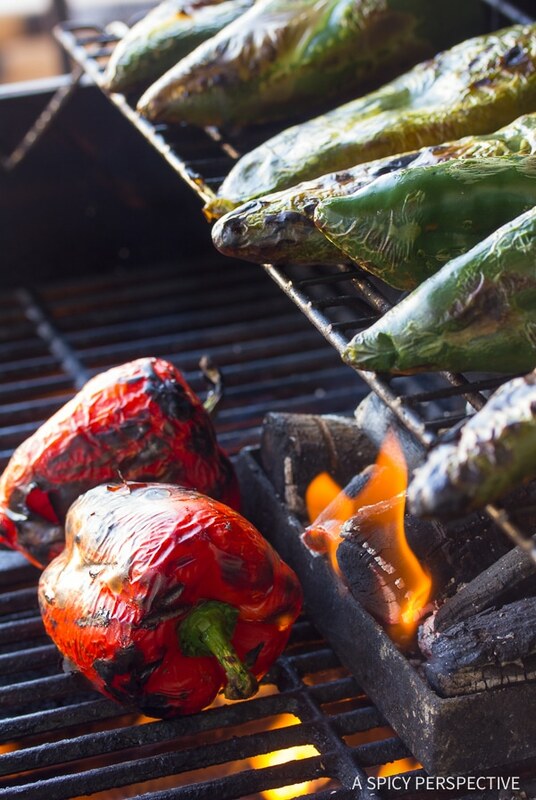 Poblano peppers are a favorite and they are gorgeously stuffed! Beautiful flavors all around and love this puree! One of husbands favorites is chile rellenos. Not sure he’d give them up but these stuffed poblanos are enticing. The fragrant coconut rice compliments the goat cheese stuffing, just scrumptious! I have never made poblano peppers. Plain or stuffed. Obviously I should – these look great! This looks like a much lighter, much healthier, and much more delicious version of stuffed poblano peppers than I’ve ever seen before! Great job, Sommer! I’m loving the stuffing. These look outstanding! Well done ditching the deep fried stereotype :) Buzzed! These sound so yummy (look too!) I am a big chile fan and can’t wait to try this recipe! That combination of shrimp and goat cheese sounds fantastic. I bet it would make an awesome enchilada, too! looks great…I don’t have any poblanos on hand, but I think that red pepper puree would be great on anything. hmnnn…! thx, Spicy! Way better than the fried version, and I love the sweetness of the coconut rice with the spicy peppers. Great dish to prepare ahead and pop into the oven! I could drink a whole bowl of that red pepper puree! YUM. I have got to make this!! I’ve been wanting to make stuffe poblanos for a while now! The presentation of this dish is gorgeous, the red pool of sauce, white rice and green chili. I love that this is not fried and you did a great remake of this dish! I love chile relleno! This recipe looks extra scrumptious. I’ve never tried it with shrimp. I am going to have to changed that. Yum! Great presentation too. Looks cool! Love the colors of the peppers and nice detailed pictures. I can not tell a lie…I love fried chili rellenos. I don’t make them myself but they are done so well, not heavy or greasy and so I know I’ll still frequent that restaurant when the urge strikes me. That being said? I never make them at home because I don’t do deep frying here…and these look and sound scrumptious. The addition of goat cheese? Well, as someone who just did a month long roundup of goat dishes including cheese…you can imagine that got my attention. I LOVE goat cheese; can’t wait to prepare these! Mmmm, I love stuffed peppers and especially when they have a little bit of a kick to them! Your puree sounds fabulous! I never eat Chile Relleno simply because it is fried and full of fat. This recipie I can do. This looks wonderful Sommer, I’m am going to try it. And coconut rice…..I love. Thanks for sharing this recipie. These peppers sound awesome. I love a pepper – pretty much any pepper – probably a little too much. These stuffed peppers sound to die for. I recently tried Poblano peppers for the first time. I really loved them so much more than bell peppers. I’ve always avoided stuffed bell peppers but may have to give this a try. The coconut rice sounds like a great contribution to these flavors. Thanks! Have a great week Sommer! Love goat cheese, coconut rice and shrimp. All together? Muy Bueno! Wow!! This looks and sounds fantastic! 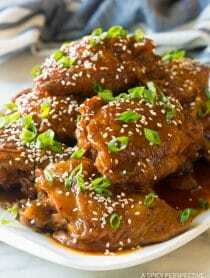 What a great recipe, I definitely have to try this out! Yes! Yum, these looks so great. And with coconut rice, too? Double yum! Really nice recipe. A wonderful dish here! I love the stuffing with shrimp and goat cheese, and the red pepper puree and coconut rice are perfect accompaniments. very true..not all chile rellanos are deep fried. great recipe!! I am going to make some bell pepper sauce too! Yours looks so tempting! Great filling and presentation!! Very mouthwatering recipe. this is a must make for me! Beautiful! What gorgeous peppers! The colors! Like for realz . . . YUM!!! And I don’t use that word often! Honestly? The deep frying is what has kept me from making chili rellanos at home – I don’t even order them in restaurants . . . 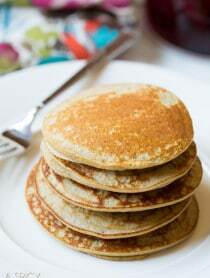 But I will be attempting these beauties for sure!